Bulls and Bears Slots is a stock market / Wall Street themed progressive video slot machine powered by Real Time Gaming (RTG) software. It features five reels, twenty-five pay lines, a multiplier, scatter wins, a wild symbol, free spins, a feature guaranteed a bonus round a fifty-six winning combinations plus a 10,000 coin jackpot. People from all over the planet, including the real money gamblers from the United States of America, can play Bulls & Bears slots for real money. Play it for free or with Bitcoin at any of the United States casinos or USA Bitcoin casino sites listed on the bottom right-hand side of this review page. Before you start to spin the reels playing “Bulls and Bears” online slots for real money you have to select the amount of cash or Bitcoin you want to wager. You can bet as little as a penny or wager as much as one hundred twenty-five dollars per spin. You also can choose several different betting amounts as this game has a lot of wagering options. Once you select your wager and spin the Bulls & Bears reels you will see excellent stock market / Wall Street themed icons. You will see the Bills, Safe, Stockbrokers, Boat, Stock Ticker Tape Machine, stocks, gold bullion, stock chart, car, ship symbols, Bull, Bear, Car, Gold Bar and the Stock Certificates. There are two wild symbols in this game, the Bull, and the Bear icon. 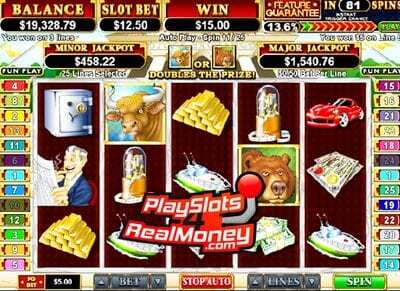 When you land a Bull or a Bear wild symbol on the wheels, you will multiply your winnings. If you land a Bull and a Bear at the same time, you will quadruple your payouts. Keep your eyes open because the icons only appear on individual wheels. The Bull will look on the second reel, while you will only see the wild Bear image on the fourth reel. The Chart icon is the scatter symbol in Bulls and Bears video slots for real money. When you land three of these scatter symbols on the reels, you will trigger the bonus round. During your free games, three will multiply all of your winnings plus you will have the chance to select the free games feature. Whether you invest in the stock market or not, playing Bulls vs. Bears can be very fun. However, investors, stockbrokers and certified financial planners can especially enjoy this game where you can go long on a stock or short on an exchange-traded fund (ETF). Obviously, this game doesn’t have symbols that are that specific as Realtime Gaming developed Bulls Vs. Bears over a decade ago. Having said that, you can still feel the rush of the stock market and get bullish or bearish playing this hot online slot machine.